In our second partnership with One Acre Fund, we’ll be following David and Zipporah, smallholder farmers from Kenya, for a whole growing season. From planting to harvest, we will check in every month to see what life is really like for a family making a living from agriculture in rural Kenya. Read part 1, part 2, part 3 part 4, part 5 and part 6. Written by Hailey Tucker. David and his wife are visibly relieved. Zipporah no longer wrings her hands while talking about what her children have eaten in the last 24 hours, and David’s handshake has a revived vigor to its squeeze. After a year that started with a minimal harvest and later brought unanticipated expenses, David and Zipporah say their anxiety is finally over. In July and August, the family’s crops matured and the food they had been waiting for was finally ready to harvest—and consume. David and Zipporah harvested 716 kg of maize from their field and had weekly harvests of collard greens after that. “We feel this will be enough to sustain us through this year,” Zipporah says. 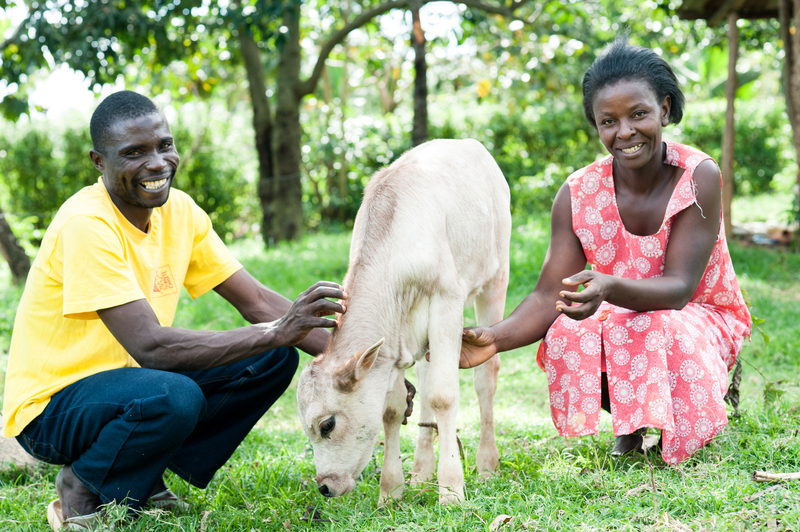 Along with their vegetable yields, the one cow the couple was able to keep over the year gave birth in August, which means the family now has fresh milk to drink and sell. The cow that David and Zipporah own also produces manure, which they can use to make organic compost to enrich their soil. With the combination of the increased harvest and new calf this year, the couple will have enough food to last them through the next wanjala (hunger season), the time when the previous year’s food supply runs out and new crops are still too immature to eat. Not only does the couple think they will have enough food for the year to come, they hope to start a small business selling household goods in 2015. Zipporah and David also want to host a wedding celebration, which they never had when they married 15 years ago. They couldn’t afford to have one then but they think this might be the year that they could. One Acre Fund supplies smallholder farmers with the tools and financing they need to grow their way out of hunger and poverty. Instead of giving handouts, the social enterprise invests in farmers to generate a permanent gain in farm income by supplying a complete service bundle of seeds and fertiliser, financing, training, and market facilitation—and delivering those services within walking distance of the 180,000 rural farmers they serve.